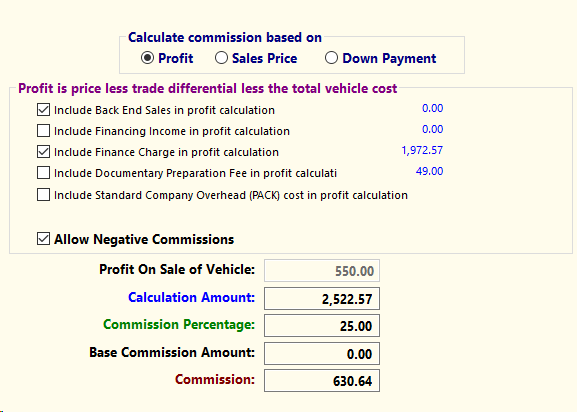 The commission calculator for a single sale is located in three spots in the software. 1) For instructions on how to calculate commissions for a single sale from Sales >> 6 - Calculate Commissions, click here. 2) The Costs tab in the Sales Processing screen then . 3) Customer Activity >> B) Customer Processing >> A - Customer Information and Costs >> Costs then . First, select what portion of the deal the commission will be based on. Most dealers pay commission based on the profit, though you do have the option to use the "Sales Price" or the "Down Payment".